CEA: Wireless and multi-room audio system sales growth continues | What Hi-Fi? New research from the Consumer Electronics Association (CEA) has underlined the growing trend in wireless and multi-room audio, with system sales continuing to increase. According to the latest data, 16 per cent of consumers now own a portable wireless speaker and a further one in ten have bought a wireless multi-room product for their home. In addition, 44 per cent of people who don't currently own a multi-room system expressed interest in getting one and 28 per cent are planning to buy a portable wireless speaker. The study – Consumer Perspectives on Wireless Multi-Room and Portable Audio Solutions – comes from a US-wide sample of 2,000 adults that was carried out in January 2014. Elsewhere, it has been revealed that 47 per cent of people said the living/family room was their main location for wireless audio solutions, followed by the bedroom (28 per cent). It was also found that consumers are "heavily" influenced in their research and purchase decisions by hands-on experience and word-of-mouth recommendations from others. The firm that arguably transformed the home sound system for the digital age was Sonos, founded in 2002 and manufacturer of products and software to "fill every room" of the home. Since then, we've seen more and more companies enter the market with their own solutions that are designed to let you enjoy your music collection from wherever you are in the house. 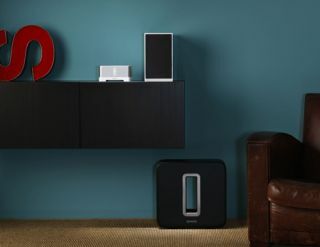 And with the advent of high-resolution audio, newcomers like Bluesound (above) could establish themselves as serious competitors to the more traditional firms in the multi-room audio arena. One thing does seem apparent from the CEA's data, however – more people are turning to wireless and multi-room audio systems in order to enjoy collection with greater flexibility.